Home / Columns / Power Rangers: Heroes of the Grid RPG proves HUGE SUCCESS for Renegade Game Studios. 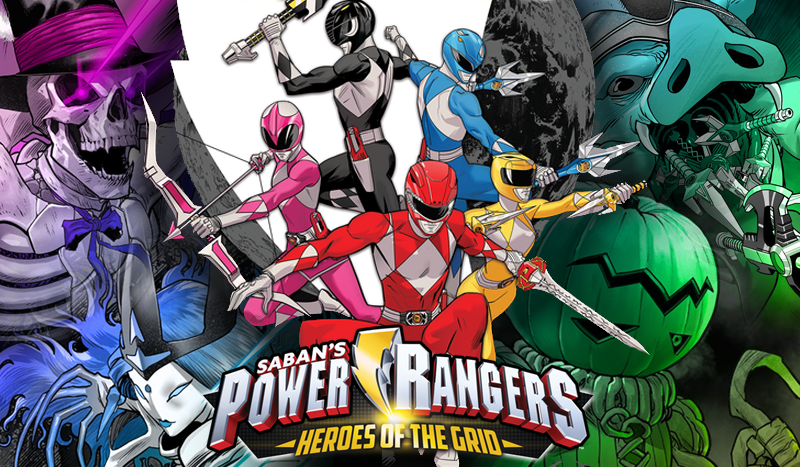 Power Rangers: Heroes of the Grid RPG proves HUGE SUCCESS for Renegade Game Studios. Remember, way back in October 2017, when I spoke about the upcoming Power Rangers Hyperforce and the potential this had in igniting a fire in the tabletop community for a co-opertative Power Rangers role playing game? Well, guess what? It did and now we’re getting one courtesy of Renegade Game Studios! Here’s my thoughts on Power Rangers: Heroes of the Grid. A couple weeks ago at GenCon, we saw our first look at the upcoming Heroes of the Grid RPG and the internet got excited! Since Hyperforce went over pretty well with the fan base, Renegade Game Studios seemed intent on capitalising on that with awesome miniatures and gorgeous art from Go Go Power Rangers artist Dan Mora. The Kickstarter launched a couple days ago and the Power Rangers community was ravenous enough to get it funded in under EIGHT HOURS! The only time I’ve personally seen something get funded that quickly on Kickstarter is when Rooster Teeth puts up a crowd funding page for their movies or card games. It’s a testament to the hunger for this kind of product that we’ve now unlocked two of the additional stretch goals and I’m super proud of the community. But what is Heroes of the Grid and what do you get for funding this project? Here’s the rundown! Pledging $75 (roughly £60) gets you the base game set, which is set to run for around $90 msrp, and includes a whole host of goodies including the core MMPR team, Rita, a selection of famous monsters and an army of Putty Patrollers as miniatures, along with their ability cards and scenario cards. Pledging at the $150 (£118) mark gets you the base game and the two expansions; Green with Evil and White Light. These Green with Evil expansion come with a different sculpt for Rita in a Boom Studios outfit, and evil Green Ranger, Scorpina, and oddly, Tenga Warriors. The White Light expansion Includes a White Ranger, Lord Zedd and a contingent of Z Putty Patrollers. Already, Renegade Game Studios are covering their bases to give people the storylines and characters people love from the Mighty Morphin era and I’m loving all of the miniatures (even if I’m too broke to support this at the moment). Pledging a whopping $240 (£189) nets you everything I’ve mentioned before as well as the Shattered Grid expansion which includes the Hyperforce Rangers and Time Force Pink! I know a lot of Hyperforce fans will be glad to know you can also buy that as an add-on for the two lower tiers too! In that, you also get Ranger Slayer and Black Dragon monster figures, a cadre of Mastodon Troopers, and Lord Drakkon, himself! At the Morphin Master pledge level, you also get a Ranger-themed dice pack, a pack of additional Foot Soldiers and a Mighty Morphin Megazord figure! I think I should mention the size of these miniatures at this point and when Renegade Game Studios says they’re oversized, they mean it. They should be great for people who find it hard to paint standard miniatures, like me with my broken hands. There’s also a page on the Kickstarter that explains the game mechanics but I’ll let you guys check that out for yourselves rather than me mess anything up. Suffice to say that it’s definitely a game I’m interested in playing and I hope I can jump on board with this soon! As of time of writing, the Kickstarter is a little over $130,000 and they’re creeping towards their next stretch goal at $185k. It’s undoubtedly a success for Renegade Game Studios and the fans have shown their love for it so if this is going to be an ongoing endeavour; which team would you like to see released next? Have you contributed to the Kickstarter? What’s your favourite part of the game as it’s been shown to us? Let us know in the comments and stay tuned for more news, reviews, and more from Toku Toy Store!